I’m at a business convention in Orlando, Florida this week, which is not my favorite place to be. I have nothing against the city: it’s family paradise. But many visits to Disney’s kingdoms and Universal’s fantasies have left this mom with a deep desire to visit almost any city but Orlando when I’m wearing my professional hat. Still, this trip, like the smaller trips to the local grocery, post office, neighborhood restaurant, almost anywhere back home, have brought the wonder of publishing into clearer focus. I tried not to use job time to market Twist of Fate. To do so would be unprofessional in my view—I’m at this convention to learn how to write about a housing-related product that helps to pay my bills. However, although this is a fairly new client (I’ve been doing their magazine one year), I have already developed friendships with some of the people in this industry, and when they ask me what’s new in my world, I tell them. One woman in particular (yes, it’s you, Mary) was very supportive and proud of what I’ve done. I could see that she wasn’t lying when she told me it was an inspiring accomplishment. It’s people like Mary that make the hours and hours of rewrites, the months of waiting for something to happen once the book has left your hands, the countless stories from authors who have never made a dime—insignificant. I should understand this – how many times have I told my talented musician brother Mark that, while he is not making a living by playing his many instruments – he has truly accomplished something in his life by pursuing what he loves. There are so many people out there that don’t have that opportunity or that never even discover what passions lie within. 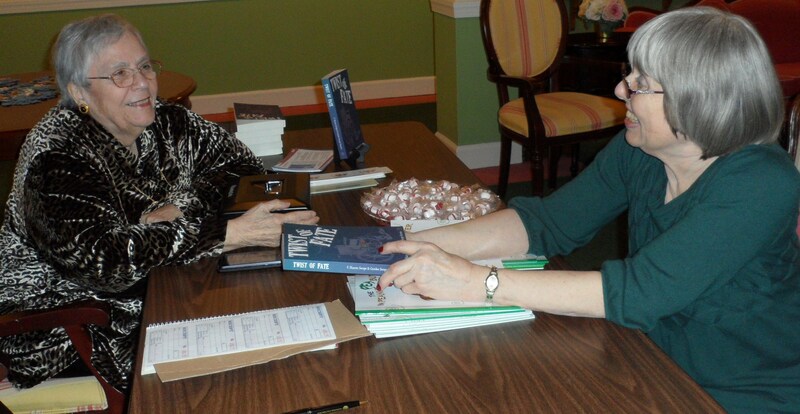 To those of you who are authors like mom and I, this picture, which was taken at our most recent book signing (thanks to Potomac Place in Woodbridge! ), is why we do this. The woman purchasing our book is a reader, and readers are what drive authors. She was very excited to meet a creator of the words that entertain her—that take her mind to places of adventure. To her, that’s art. And that makes it all worthwhile. Very inspiring blog! Keep the words flowing!! So proud of both of you for your accomplishments and glad you’re enjoying the great things that come with being a published author. We may not make much money but the faces on our fans when we tell them we wrote the book… Is worth all the hard work. Hope you survive Orlando! Hi, Genilee! I wanted to let you know that I have nominated you for the Liebster Blog Award. You can visit my blog at http://jenniferthompsonbooks.blogspot.com if you’d like to participate and find out more. 🙂 Thanks!